Want to get your students excited about Shakespeare? 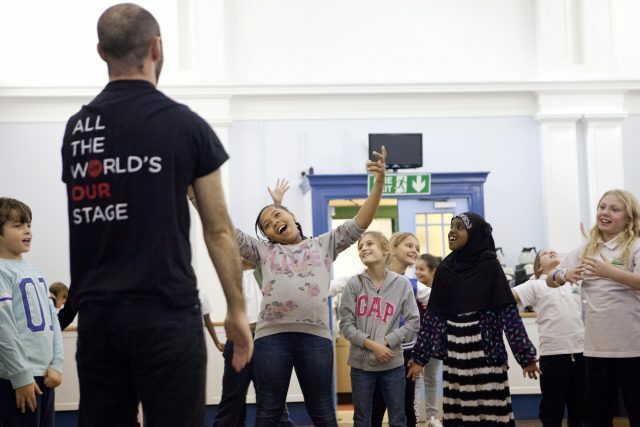 SSF has over 15 years experience delivering inspiring workshops to schools across the UK. Whether we’re working with a KS2 class encountering Shakespeare for the first time, or a GSCE group preparing for their exam, our rehearsal room techniques will ensure their experience is active, engaging and rigorous. Any UK school can book our student workshops. Whether or not you are taking part in the Festival, our standalone workshops will invigorate your pupils’ learning and your own practice. Our workshop will be specially tailored for your group. We’ll simply ask for a little information about the students and your objectives for the session. Workshops are £850 for a whole day (5 hours) or £500 for half a day (2.5 hours). Workshops are for a maximum of 35 students. Contact our Workshops Officer Louise de Froment to enquire. Loui[email protected], 02076011800. Introduce your class to the magical world of Shakespeare with a half day workshop exploring the characters, places and story within A Midsummer Night’s Dream. This workshop is expertly tailored for the Early Years, to keep each participant highly engaged throughout. Our approach ensures this early encounter with Shakespeare is fun and accessible. In this workshop pupils will explore the stories within Shakespeare’s plays, meet fascinating characters and begin to unlock his thrilling language. You can also add Arts Award Discover to this workshop allowing your students to gain the qualification in a day! Our Play in a Day Workshop for KS2 focuses on exploring a play of your choice, bringing it to life in a dynamic and exciting one day experience. This will culminate in a performance sharing to an invited audience. You can also add Arts Award Discover to this workshop. Complement your pupils’ study of Shakespeare in the classroom with our active session. Use it to introduce a play, or to re-invigorate your students’ learning. Pupils will explore the themes of the play in a modern and historical context. They will engage with the characters, their motivations and relationships, and how this influences their language choices. Thinking as actors, they will use evidence from the text to develop their own critical opinions. Depending on where your students are in their learning journey, you may want to request a deeper exploration of language. We can crack verse structure, play with stress and bring Shakespeare’s imagery to life. This workshop develops skills for the study of Shakespeare in English or Drama. We can base it on any Shakespeare play. Grounded in the GCSE Assessment Objectives, this workshop uses rehearsal room techniques to develop the skills for the study of Shakespeare at GCSE. Students will engage with the themes and characters of the play in a historical context. They will work as actors and directors to explore scenes in detail, engaging with key characters and examining how they are manifested through their language choices. Students will use evidence from the text to develop their own critical opinions. This workshop is for students studying Shakespeare as part of their English Literature GCSE. We currently offer GCSE workshops for Macbeth or Romeo and Juliet. 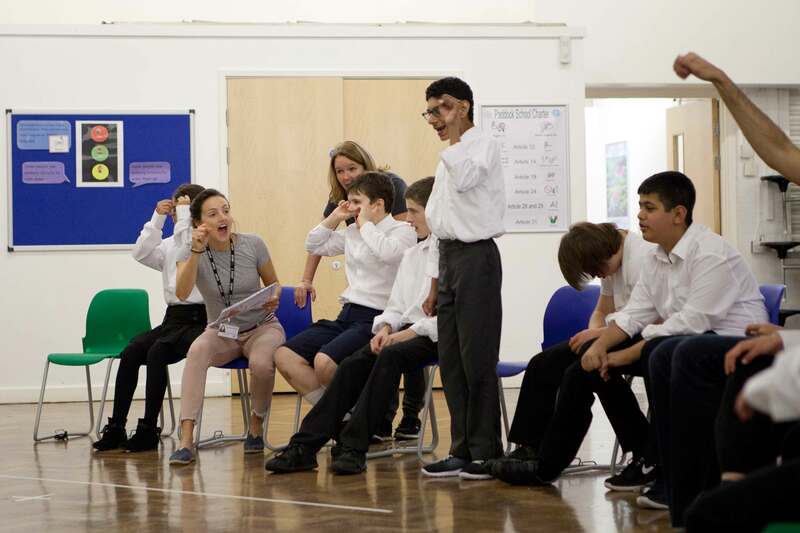 SSF’s active and inclusive approach engages over a thousand pupils with Special Educational Needs each year, proving that Shakespeare is for everyone. Our workshops are an opportunity for students to explore emotions, relationships, motives and consequences. They are also a unique opportunity to play with language, helping students to find greater articulacy and boosting communication skills. Our workshops for SEN schools are always bespoke, built in accordance with individual needs and areas of interest. Often this takes the form of an introduction to a play and its characters, or an exploration of a particular theme. We have delivered workshops to young people with a wide range of needs and abilities, and will work with your staff to ensure everyone gets the most out of the sessions. For three weeks over the Summer Term of 2017, SSF collaborated with Queensmill School, a specialist school in London for young people on the autistic spectrum, enabling every class to be involved in an immersive discovery of The Tempest. With daily sessions on theme and character, pupils aged 3-25 experienced the world of the play according to their needs and interests, with the aim of developing their communication skills, imagination and confidence. Exploring the sensory world of the sea, discovering the monster’s cave and creating magical spells led to playful interactions and enjoyment for the young people across the project. The chants of “Aye Aye Captain” and “Ban Ban Caliban” filled the school. In a unique culmination of the project every class performed their own show. Over a period of two terms in 2017, SSF collaborated with Rushmere Hall School, a Primary School in Ipswich with a specialist Speech and Language hub. The project was themed around A Midsummer Night’s Dream and focused on young people with identified speech, language and communication difficulties. Workshops took place every two weeks throughout both terms, each one focusing on an element of Shakespeare’s world as well as a speech, language and communication aim. Students delved into the setting for the play (a magical forest) using soundscapes, word and action. They also helped each other to find their way when they were lost in the woods, discovered a group of actors trying to put on a play in the forest and explored the theme of fairies. The whole process helped to enhance pupils’ communication skills and emotional literacy as well as building confidence, ending in a celebratory promenade performance. Don’t see what you want? We can work with you to create a unique experience tailored to your requirements. Prices for our bespoke workshops vary depending on group size, duration and scale. Please call or email us to discuss. To discuss or to book please get in touch with our Workshops Officer: [email protected] or on 020 7601 1800.